Color correction is a popular process of filtering light in photography, film, television and other disciplines. The primary goal of this technique is to filter and alter the overall color of the light to achieve the mood or look a scene or a photograph needs. Good thing technology today can provide us with an easy way of attaining color corrections through high-end cameras and equipment. In photography, it is sometimes a need to do some tweaks in the lighting by means of color correction to achieve a nice look and feel depending on the purpose of the photo. Fortunately, Photoshop was born and filtering light and correcting color in your photos can be achieved in just a click. Having said this, I bring you another set of Photoshop actions featuring the color and light effects of some of my most favorite movies. 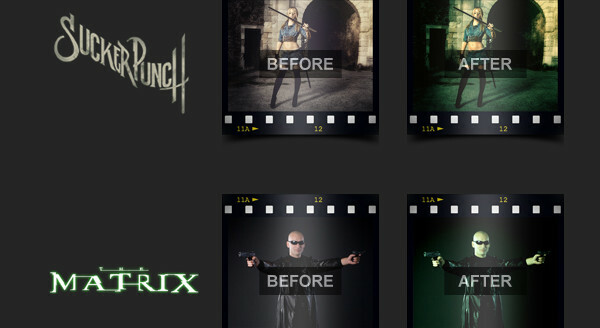 Your concept of adding that movie style effect on your photos can now be realized through the use of this set of actions! Enjoy and share! Share us your thoughts or might as well tell us what other freebies would you like to see on our next posts by commenting below. You can also hit us up on Facebook, Twitter and Google Plus for more updates, design news and features, or better yet subscribe to our blog for the freshest design inspirations and stories straight from our design labs.